Attendees pack the bustling AES New York 2018 Convention exhibition floor, featuring over 300 brands of the latest gear and services showing their new and most popular offerings. 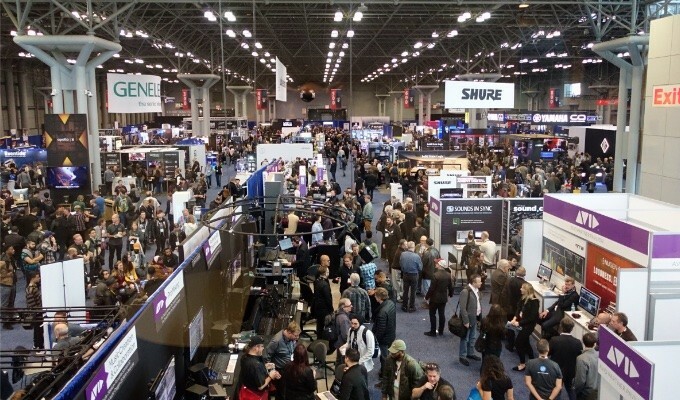 New York, NY, November 6, 2018 — The recent AES New York 2018 Convention, held October 17 – 20 at the Javits Center in New York City, provided a wide array of chances to listen, learn and connect with audio engineering professionals from around the world. A perennial highlight drawing a packed crowd of attendees of all backgrounds and skill levels was the sprawling Exhibition Floor, where over 300 brands of audio equipment manufacturers and service providers were showcased alongside a wealth of free-to-attend events. John Monitto, Meyer Sound's Director of Business Development and Sales Manager, Northeast, stated, “This past AES convention at Javits Center in New York drew some of the top audio professionals who we value as a manufacturer. The convention was well attended by those professionals who visited the exhibit booths, demo rooms and the workshop sessions. Meyer Sound featured a two-channel and 5.1 listening room with our newly patented Bluehorn System, which received a high level of traffic and very positive comments. We were also proud that our co-founder, President and CEO John Meyer, was honored as the Richard C. Heyser Memorial Lecturer."